Why Decrease the Budget when offerings exceeded expenses? Although our offerings exceed expenses year after year, our budget has remained higher than our offerings. 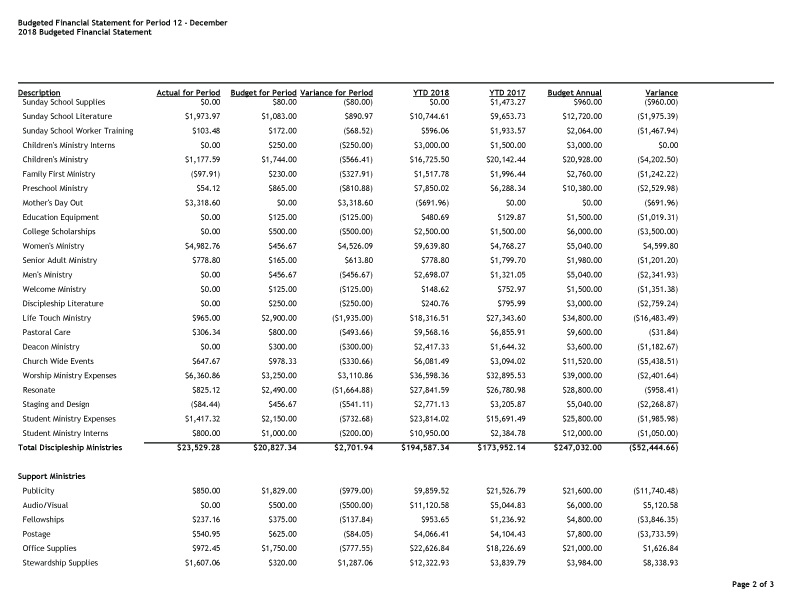 Last year, our budgeted expenses were $3,242,052 while our offerings were $2,839,429. That is a $402,623 difference. This year, we have begun the process of lowering certain budget line items to reflect actual expenses in those areas, rather than leaving them for contingency. This budget proposes a 3.43% decrease of last year’s budget, with the reduction being in those budget line items historically underspent. When comparing budget to actuals (rather than budget to budget), it is a projected 10.58% increase over last year’s expenses. While slightly ambitious, we will still maintain good stewardship to only spend what the Lord provides and fully expect offerings to exceed expenses as they have for years. In 2020, we will again examine our budget to make further progress in reducing any line items in the budget considered “contingent”. We have a Stewardship Committee of 6 members serving 3-year terms that meet regularly with the Senior and Executive Pastors. Each month, financials are reviewed by the Committee and then presented to the Church for approval in a monthly business meeting that meets the last Wednesday of the month at 6:30 pm. Towards the end of the fiscal year, the staff and committee prayerfully work together to prepare the proposed budget for the next year. Prior to a Church Vote, there is a special called business meeting (March 27) to discuss and then preliminarily approve the budget for a final vote by secret ballot in all worship services (March 31). What is the Annie Armstrong Special Offering? What is the Mary Hill Davis Special Offering? What is the Lottie Moon Special Offering? What is the Society of Samaritans? What is SBC Mission Dignity? What is the budget line item, Mission Projects - Strategic? 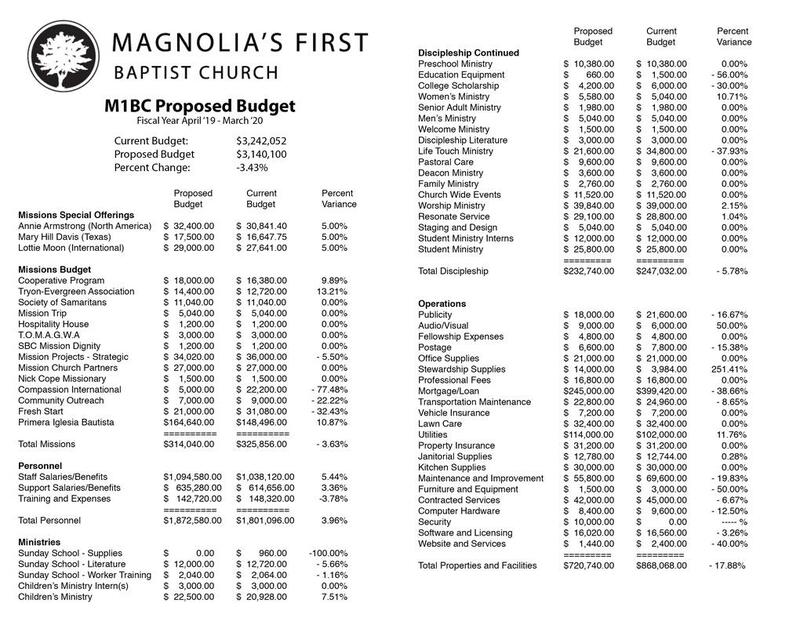 This is a budget line item that allows M1BC to support various mission projects that arise throughout the year. Currently, it helps send out short term missionaries from our church, supports the Davis family who grew up at M1BC and is now serving at a church plant in Arkansas, and also supports a ministry in Greece developed by East West Ministries of whom we have partnered with for Short Term Missions. What is the budget line item, Mission Church Partners? This budget line item is a compilation of the previous annual support given to our Magnolia Cowboy Church Mission and then to the New York/Long Island Churches being planted by the Edwards family. The Magnolia Cowboy Church is now officially standing on their own and the Edwards family is now fully supported by the North American Mission Board as they continue their work in New York. Since both these ministries are now fully supported, we are prayerfully considering God's next challenge for M1BC to support or plant other Churches. What is the N. C. Ministry? This is an international ministry supported by M1BC. Though we cannot share exact location and details, we are excited about what God is doing and if you would like more information, please contact Pastor Milt for more information. What is Compassion International and why was it decreased? Compassion International is a Christ-centered, church-based and child-focused sponsorship program. The people of M1BC support hundreds of children all over the world! In our Church budget, we also provide monthly support to Compassion. There is a significant decrease in the budget for a couple of reasons. We previously supported two college students in the Compassion Program. This program is no longer provided and our support has transitioned to children in the program who remain unsponsored. Also, in past years, we have traveled to three compassion projects in Honduras to meet and spend time with the many children who are sponsored by M1BC families. Due to the political climate in Honduras, we can no longer make those trips. Though our financial commitment for Compassion has decreased, our love for the ministry is unchanged! Community Outreach is the efforts by M1BC to reach and engage people for Christ in our own community. This includes special projects, mailings, events, etc. What is "Fresh Start" and why was it decreased? Fresh Start is a ministry to families in need of financial assistance. Fresh Start will work with a family to help coach them to financial stability while bringing the love of Christ. While there is a decrease in the budget, the ministry continues to grow as we reach more families. Also, more and more families are "giving back" to Fresh Start decreasing the overall impact on the Church budget. What is "Primera Iglesia Bautista" and why was it increased? Primera Iglesia Bautista (PIB) is our outreach to the Spanish language demographic in our community. 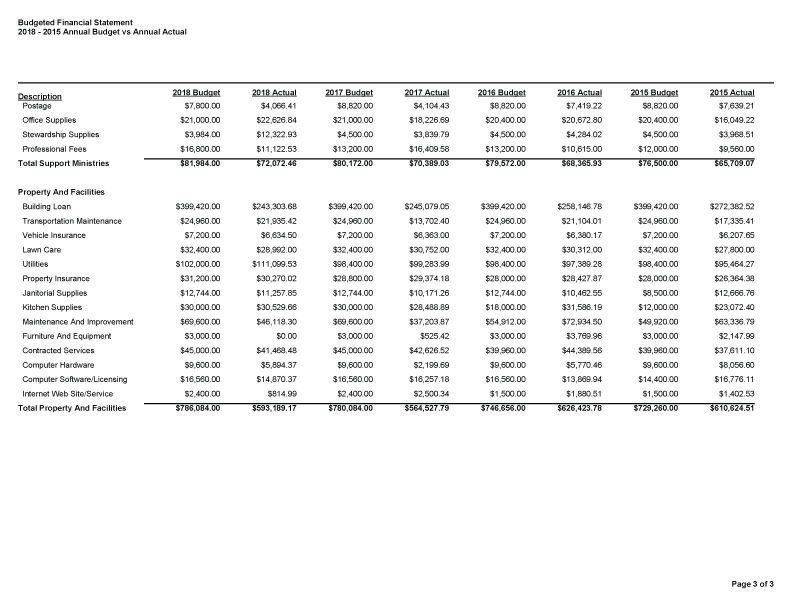 This budget line item includes personnel and ministry costs related to PIB. There are other costs related to PIB including space/building allocation, office supplies, transportation and other resources not accounted for in this line item. While we consider the membership of PIB as fully part of Magnolia's First Baptist Church, we would not be able to reach the Spanish speaking population without this outreach. The increase to this budget is due to cost of living and health insurance premium increases and an increase for ongoing outreach and ministry. Why was the "Sunday School - Supplies" budget eliminated? 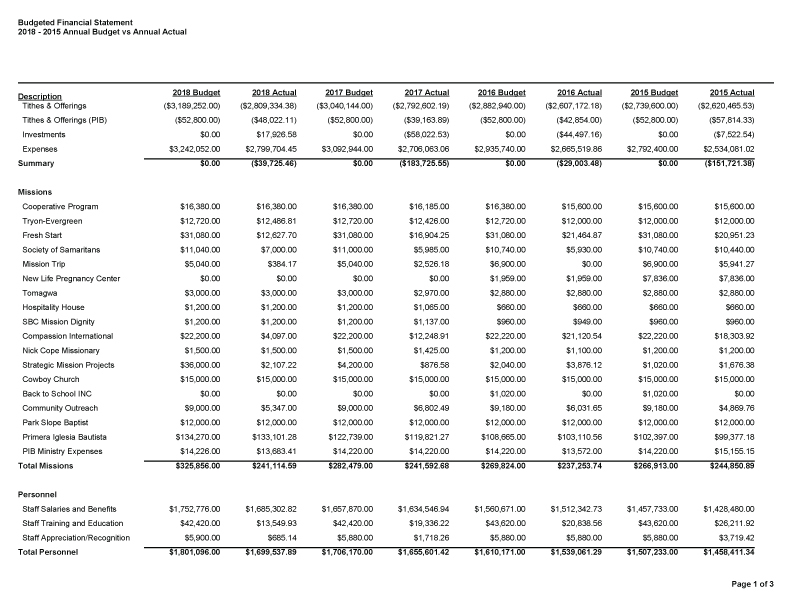 This was a smaller budget that was historically unused as the Church has grown and related expenses fit in other broader categories of the budget. The change is to update/correct an aged chart of accounts. 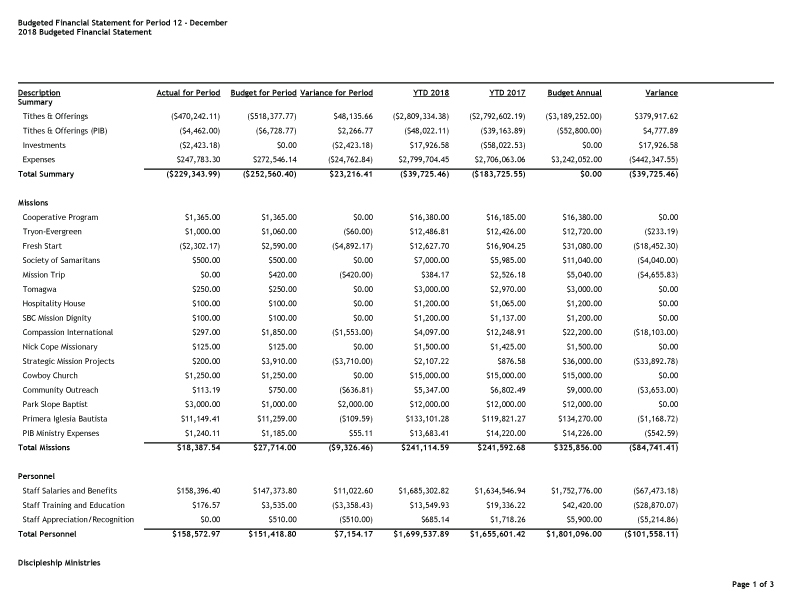 Why was the "Life Touch Ministry" budget decreased? Life touch is our counseling ministry and although the budget has decreased, the ministry is growing. The decrease in the budget is based on actual expenses over the last few years being less than what was budgeted. This is a budget that will be "over-spent" as needed, but the proposed budget is a better reflection of expected expenses. What is "Stewardship Supplies" and why was it increased? The Stewardship Supplies budget was originally for offering envelopes and related expenses. As our culture has changed the way we give and make purchases, our online giving has increased. Previously, online transaction fees were coded to "office supplies". Though this seemed appropriate at the time, online giving has become more and more the new norm for our culture. In mid 2018, we began coding transaction fees to this budget to better reflect actual expenses. 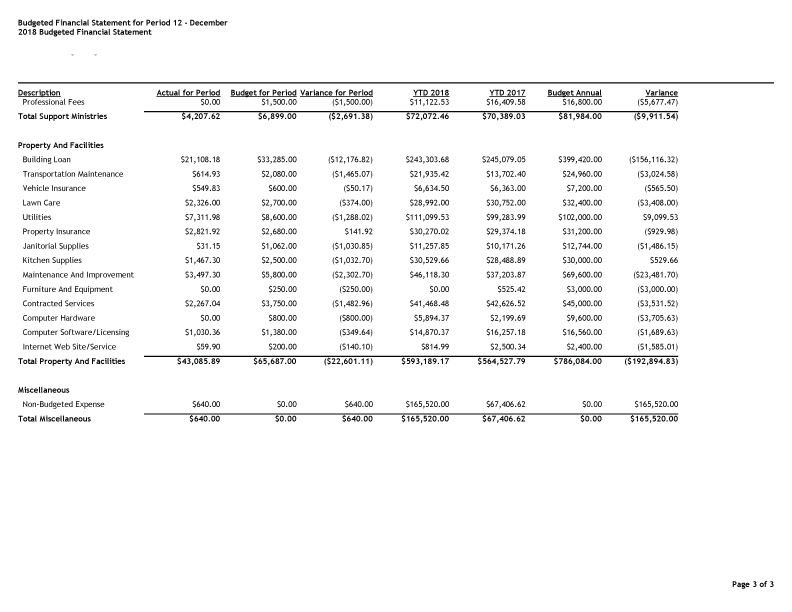 Why was the "Mortgage/Loan" budget decreased? 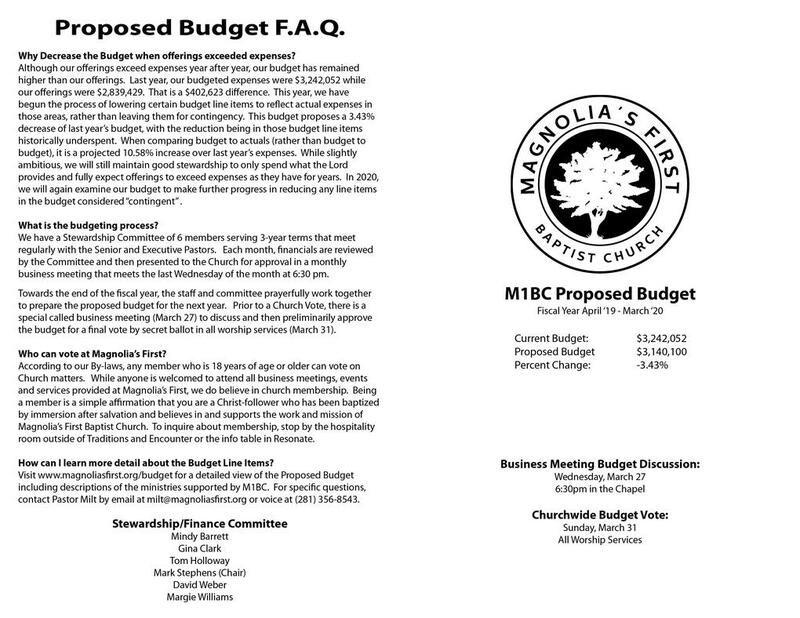 M1BC has kept an inflated budget for our loan payments in an effort to demonstrate our commitment to debt retirement. Each month we make an accelerated principal payment of an additional $8000.00 from designated offerings. 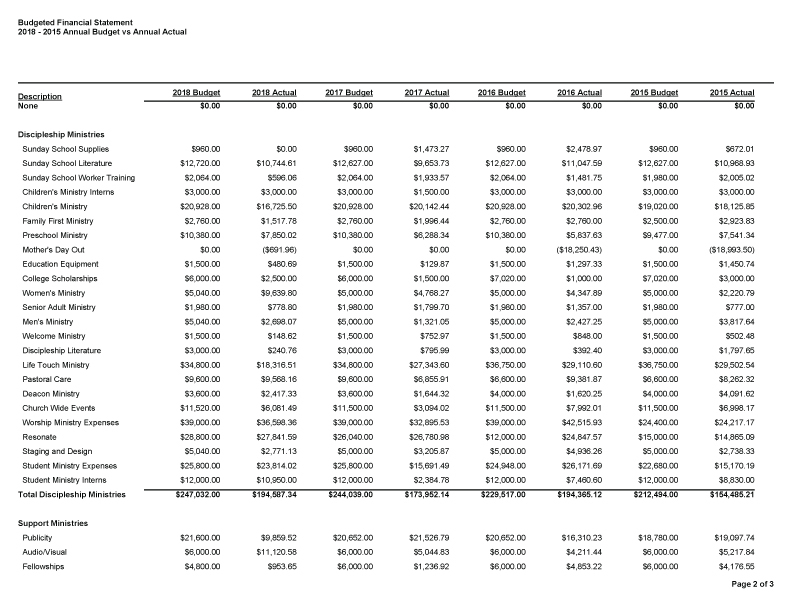 In addition to our monthly accelerated principal payments, we also examine our financial health at the end of each year and make an annual one time principal payment from this budget. At the end of 2018, we made a $100,000 accelerated principal payment with 50K coming from the budget and the other 50K from designated giving. In 2018, with monthly and the end of year payments, we paid an extra $196,000 towards debt retirement over and above our monthly obligation to regular loan payments. We are committed to debt retirement! However, due to this budget being "inflated", we discovered that newer members interpreted this as a lack of commitment to debt retirment. As a result, we have lowered this budget to reflect actual expenses but will continue our high commitment to debt retirement with the monthly and year end accelerated payments. If you would like to participate in reducing the debt, you can make an offering designated to "Debt Retirement."